In Huzoor’s recent journey to Lahore, among the many achievements that have been mentioned previously is a lecture delivered by Hazrat Khalifatul Masih II [may Allah be pleased with him] that was successful in every respect and shall remain memorable and noteworthy for times to come, Insha-Allah. The aforementioned society has been established for two years now in the Islamia College and its founder is Syed Abdul Qadir MA, Professor of History. Syed Sahib visited Huzoor[ra] many times during his stay in Lahore and held discussions on religion and history deep into the nights. Eventually, on the evening of 24 February 1919 when Hazrat Khalifatul Masih[ra] had intended to return to Qadian, Huzoor was requested to deliver a lecture on an aspect of Islamic history to the Martin Historical Society on the evening of 26 February. This request was made at the last minute. There was a lack of resources due to being on a journey and doctors had discouraged Huzoor[ra] from delivering speeches for his own wellbeing. Despite all this, Huzoor readily and wholeheartedly accepted the request. On the 26th, at 7:15pm in the Habibiya Hall, he delivered a lecture on the start of disorders in Islam. Due to the very short timeframe, the announcement about this lecture could only be made to colleges. To listen to the lecture, tickets were required. Yet, despite all this, there was an incredible turnout and it is quite possible that of the functions conducted by this society, this drew the most attention. The society appointed Sheikh Abdul Aziz Khan BA, Honorary Secretary for Anjuman-i-Himayat-i-Islam, as chairperson for the event. For some reason, however, he was unable to attend at the fixed time and so, the event commenced under the permanent president of the society, Syed Abdul Qadir MA. After tilawat by Hakim Muhammad Hussain Qureshi Sahib, Secretary Anjuman Ahmadiyya Lahore, Syed Abdul Qadir gave a few opening words as the chairperson. “Dear audience! It is customary for the chairperson to introduce a speaker before they take to the stage. However, today’s speaker has such respect and recognition that very few of us here will be unfamiliar with him. You are the successor of the noble and chosen human being who set about a storm in the religious world, particularly against Christianity. “I have had the opportunity to study the past century in minute detail. On this basis I can say that in this period, three notable humans were born. There is no doubt in the fact that the 19th century was a sorry time for Muslims. However, it gave birth to three individuals of various natures. “One of them was the one who led the Muslims during the sensitive period of the 1857 Mutiny and, to a large degree, saved the Muslims from destruction. Had he not been around to help, a state such as Hyderabad would not be around. “The second was Sir Syed [Ahmad Khan] who caused a revolution in the educational world. “The third individual was Hazrat Mirza Ghulam Ahmad [on whom be peace] who broke extraordinary new grounds in the religious world. “You are all aware that Hazrat Sahib[as] appeared at such a time when the spiritual condition of Muslims was at an all-time low. In such a climate did Hazrat Mirza Sahib reinvigorate the Muslims and urge them to return to their true faith. “How successful was he in his endeavours? I need not say anything about that. The proof of that is here before you. It was not my intention to deliver a long speech, rather it was my desire to inform you that today’s speaker is the successor of the person who caused a revolution in the religious world. Prior to Hazrat Khalifatul Masih’s speech, someone from the audience who had a large piece of paper in his hand began announcing a fatwa. But before he could complete his sentence, the secretary of the society instructed for him to be ejected. As he was being removed, he promised to remain quiet, to which he was permitted to stay. “A short while ago I received the news, with great pleasure, that a society has been established in the Lahore Islamia College in which those who are acquainted with historical facts will present their research. I was overjoyed by this, as familiarisation with history acts as a great stimulant in the progress of nations. A nation that is unacquainted with its historical accounts can never advance towards progress. Knowledge of the circumstances of one’s forefathers guides a person to many higher objectives. After this introduction, Huzoor[ra] briefly expounded on the mischief and disorder created in the Khilafat of Hazrat Usmanra, which the audience listened to attentively. A substantial amount of time had elapsed and Huzoor turned to Syed Abdul Qadir Sahib and said that bearing in mind the notes he had prepared for the lecture, he would have needed 12 hours to complete the talk. Nonetheless, Huzoor said that he had summarised his points and then asked whether he should bring the talk to a close, to which Huzoor was told that he should carry on. Upon this, Huzoor then shed some light on the disorders created in the time of Hazrat Alira. “I have had the chance to study pages of history. When I entered this hall this evening, I thought to myself, ‘I possess knowledge of Islamic history, and I can form opinions on its history’, but having heard Mirza Sahib’s[ra] lecture, I realise that I am still a young student. The light of my knowledge and the light of Mirza Sahib’s knowledge is similar in comparison to this lamp (placed on the table) and the bulb transmitting light in this hall. “The clarity and insight with which Mirza Sahib explained such a complex chapter of Islamic history is a credit to him. There will be very few people here who can explain such a complicated subject. In my view there is no one in Lahore that can claim this. “It is extremely unfortunate that only a few years after the demise of the Holy Prophet, peace and blessings of Allah be upon him, dissension arose among Muslims. This disrupted the fabric of the Muslims. Whatever the Muslims had achieved before was a result of their unity and the sincerity and passion for wanting to spread the message of Islam. However, such people entered the fold of Islam, unfortunately, who were bent on uprooting the foundations of Islam. “There is no doubt that such people were somewhat successful in their attempts, but as you are aware, after every darkness, light is appreciated properly and after every tribulation, there is ease. Accordingly, after this tumultuous period, a time of victories came, similar to the era of Hazrat Umarra. 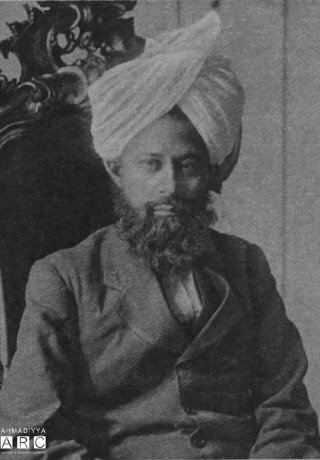 “I do not wish to take up too much of your time – it has already gotten quite late – but I implore you to reflect upon your history and observe how the Muslims spread throughout the world when they were united; observe how destructive it became when such individuals, as referred to just moments ago by Mirza Sahib, came in their midst. “The time has now come for us to put aside our differences and unite! Let us cease from abusing one another and become one. We established the Martin Historical Society so that Muslims come to learn of how they were before and their current state. There is no discrimination in this; whether you are Ahmadi, Hanafi or belong to any other sect or religion, you are invited. “Just as representatives of various faiths have come and presented their research and findings, it was considered appropriate to invite an extraordinary leader of a sect and the successor of the founder of a sect and listen to his words. “I feel that you, the audience, were captivated by the talk delivered by Mirza Sahib. It is my desire to have such capable individuals among us in this society. I am of the view that if such an intellectual and outstanding person becomes part of our society, it would set a great standard for us. If a person like you occasionally takes out some of his time to spend it with us, there is no reason for us not to succeed in our ambitions. Donations were made there and then and within only a few minutes, around 250 rupees were collected in cash and promises. After this, Hazrat Khalifatul Masih II[ra] granted permission to have his name included in the register as a member of the society, before signing his name himself. The event successfully came to a close. This lecture has been transcribed and after being approved by Huzoor[ra], it will be passed on to the society so that they may publish and distribute it.